Our infusers are unique! Made from 18/8 grade United States FDA-approved stainless steel, they will not add metal to your tea, no matter how hot your water is. Put your grandmother’s tea-ball in the curio cabinet as memorabilia and invest in a new infuser that won’t become one of the ingredients in your cup! 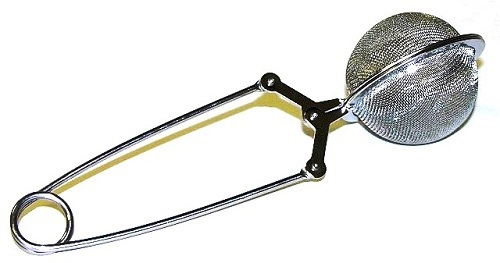 Our Sussex Derby infuser is a 2-inch tea ball with a snap-close tong, perfect for a single cup. Once it’s filled with tea, it’s used exactly like a teabag! Just place it in the cup, pour water over it and stir it around a bit to help the steeping. Remove it from the cup (save it on a saucer till the next brewing) and enjoy your tea!